On October 19th chef Grant Achatz, in collaboration with Martin Kastner of Crucial Detail and the Alinea staff, will host an experimental dinner testing concepts, dishes, service methods, and techniques deemed too avante garde for Alinea. • Seating will be limited to 30 guests. • Tickets available by lottery only through this website. • Tickets are non-transferrable and cannot be sold or traded. • Due to the nature of the event, we regret that we cannot accommodate vegetarian or any other dietary requests. • There is no charge for the event. 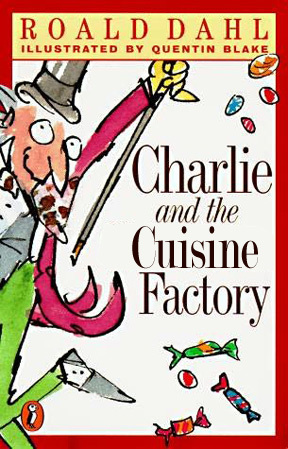 Charlie Bloggert was a boy who had a food blog. Having a food blog did not pay very much, and so he had to live in an old, old house with his Grandpa Jacques and his Grandma Julia and his Grandpa Ferran and his Grandma Alice and his iMac G5 with Snow Leopard. They lived on large pots of chilled beet soup and old episodes of $40 a Day With Rachael Ray, and dreamed of someday getting to eat at famous restaurants like Charlie Prodnose’s and Fickelgruber Laundry and Per Slugworth. But the finest restaurant of all, the one Charlie most dreamed of eating at someday, was Chef Grant Wonkatz’ Alinea. “Tell me about Alinea, Grandpa Jacques,” Charlie would say, for he was always in desperate need of material for his food blog. “But how does he do that, Grandpa Jacques?” Charlie asked, furiously pressing “Save” on WordPress. The next day Charlie turned on the internet to find that a girl named Violet Beauregarde in New York had won the second Golden Ticket. Her father, a round little man with his hair combed over his head, was talking to the camera. FLASH! went the bulb on Mike Teevee’s pocket camera. “I wish you wouldn’t do that right in my eyes as I’m speaking,” Chef Wonkatz said. “Well,” continued Chef Wonkatz, “I have found a way to Tweet… food.” And he opened the doors to reveal a gleaming white complex of cubicles and computers, at which dozens of casually-dressed Oompa-Loompas sat, furiously typing and then pressing “Send.” At the front of the room stood a plexiglass booth, and inside it was a plate of food neatly threaded onto a metal skewer, and a computer with a large camera-like device attached to it. “Watch this,” he said, and suddenly the booth was filled with a brilliant white light. When it faded, the food was gone. “Where’d it go?” asked Charlie. “It’s tiny,” Mrs. Beauregarde said. “It only has 140 characters to capture everything about the dish,” Chef Wonkatz said. “And this one is an oyster topped with yuzu—” Chef Wonkatz said. “I must admit, at the moment I’m not so sure,” said Chef Wonkatz. And in a flash Veruca had bounded the barrier and popped into the kitchen. “Stop, you’re not clean enough to be in the kitchen,” Chef Wonkatz shouted. “Who are you saying isn’t clean?” Mrs. Salt, offended, shouted back. Veruca hunted through the large steel refrigerator for something to her liking. “Kangaroo meat… filet of snozzcumberous… Wonky, don’t you know you’re killing yourself with all this stuff?” As she went on, tossing packages over her head, Veruca didn’t notice that a group of Oompa-Loompas was sneaking up behind her with a large plastic bag. “Say, what are those Oompa-Loompas doing?” Mr. Salt said. “They’re making sure the meat in the kitchen isn’t contaminated,” Chef Wonkatz said. “Veruca!” screamed Mrs. Salt, but a moment later the bag was over Veruca’s head and six of the Oompa-Loompas were inserting one end into a large silver machine. A kind of rumbling noise came from the machine, and then suddenly the plastic seemed to stretch tight over Veruca, following her shape perfectly. “What have they done?” screamed Mrs. Salt. “They’ve vacuum-sealed her to keep her fresh,” Chef Wonkatz said resignedly. For enjoying pleasures while you may. Brown rice that tastes like last week’s mail. (And soon make noises with her pants). We’re cooking this young Salt sous vide. Merci beaucoup for the heads-up.